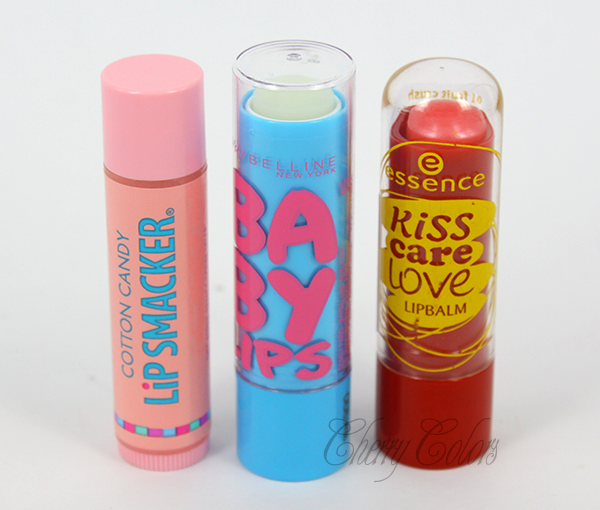 Comparison: Lip smacker, Baby lips and Essence lip balm - Cherry Colors - Cosmetics Heaven! I am very picky when it comes to lip balms. I want them to stay long on my lips, so I don't have to buy a new one every single week. I also want them to have a lovely texture :). And of course, I don't want them to leave sour, icky lips behing (like vaseline does to my lips). I got Essence lip balm in Fruit Crush (bubble gum scent), Maybelline baby lips in Quenched (no scent) and Lip smacker in Cotton Candy. I first thought about getting the similar ones, you know orange/orange/orange or something similar but I couldn't find any neutral in both the Lip smackers and Essence line. Lip Smacker comes in this sleek looking tube. It has a small cap on the top which opens with a noisy 'pok' sound. It is sturdy, but noisy. Contains 4g of product. Maybelline Baby lips has a nice package, that is very easy to open. No complaints here. Contains 4,4g of product. Essence lip balm has a sturdy little package, that is somewhat hard to open. I had to pull using a lot of force to open it every single time. I hoped it would getter with usage, but the improvement was minimal. It is somewhat smaller than the Baby lips package. Contains 4g of product. Lip smacker has this creamy texture that leaves a somehow watery feeling on the lips. Ok texture, but not my favorite. Maybelline Baby lips apply extremely well - smooth, leaving hydrated lips behind. I am extremely pleased with the texture and application of this product. Essence goes on frosty. As in harder to apply and leaves a waxy feeling. Also a slight tint to the lips. An OK feeling, but not the best. The Lip smacker stayed less than an hour on my lips. I don't know what's going on here, seriously! It smells nice, tastes sweet (funny enough), but it won't stay for long enough! I am so dissapointed, since I have like 4 more of these! It is a good product, with really bad staying power. Maybelline Baby lips stayed somewhere between 2-3 hours on my lips. Which is OK. Not great, but fine. I got the feeling it dissapeard into oblivion quite quickly, but the moisturized lips stayed a while longer. I am sad, because of all three it has the best texture. Still the staying power is not great. Essence really kicked me off guard here. Because of the waxy texture it stayed the longest on my lips. It offered some kind of protection to my lips in this freezing weather. It also has a nice scent and a lovely tint. I'd say that my top choice would the be Baby lips, followed by Essence and the Lip smacker being the last. If the Baby lips would offer a better staying power, they'd be the absolute winners, but this way they're just OK. My kid also ate all three of them. He has a fixtion with sticking his fingers in whichever tube of lip balm he can find. The first one to 'go' was the Baby lips, followed by the Lip smacker and now I am left with one tube of Essence lip balm, just because I have it in my jacket pocket. Damn!